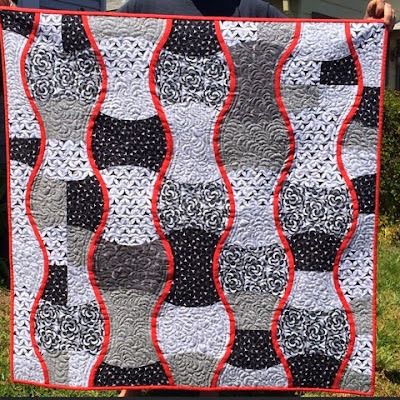 The title is tentative but the quilt is not. 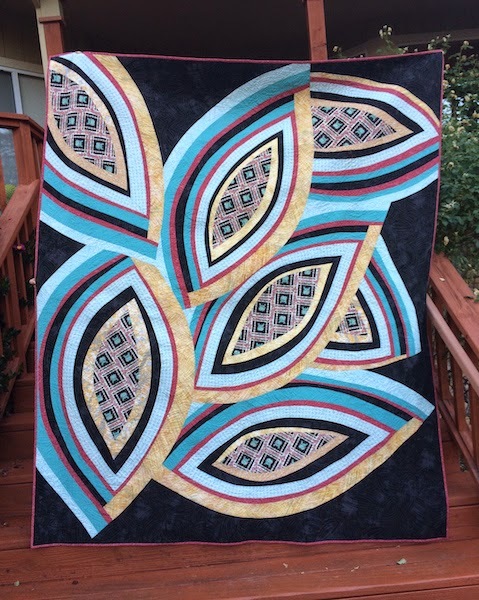 I'm thrilled to share my latest finish. 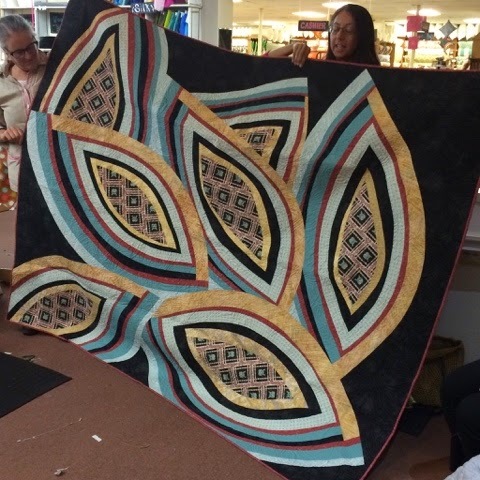 It features Anna Maria Horner's Loominous fabric and will be on display at Hart's Fabric if you're local. 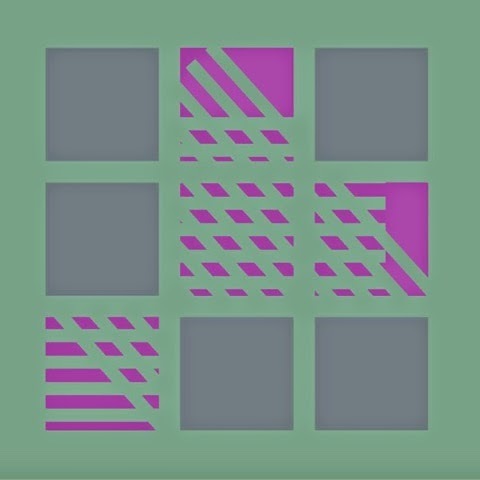 The pattern was generated by me and the computer using Play-Crafts tool, Equal. 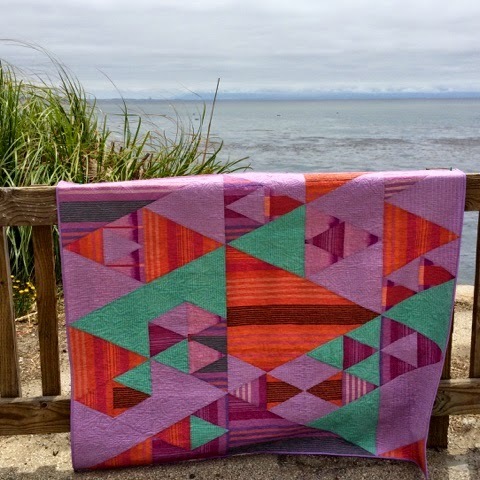 (edit: Anne will be lecturing at QuiltConWest'16- can't wait!). Turns out trying to photo shoot in the afternoon on a nice Memorial Day weekend isn't the easiest thing to do. I thought I'd pop down to the village for a few quick snaps but it was so crowded that I kept driving. Depot Hill overlooks Capitola Village and was slightly less populated. I found a 24 minute parking space and here you have it, some glamour shots. On last "in the works" pics for those not on IG. You can also see this post for more of the backstory. Linking up to Let's Bee Social and Finish it Up Friday. Someone at the store assumed that I used metallic thread because of the sparkles but no, illuminated twinkles on its own. 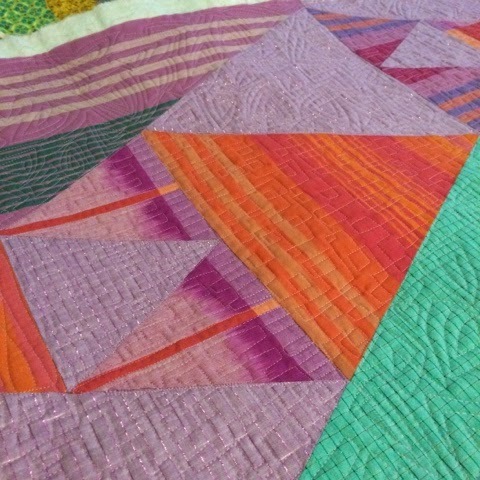 There's no shortage of texture in this quilt as accentuated by the lighting through my front windows. 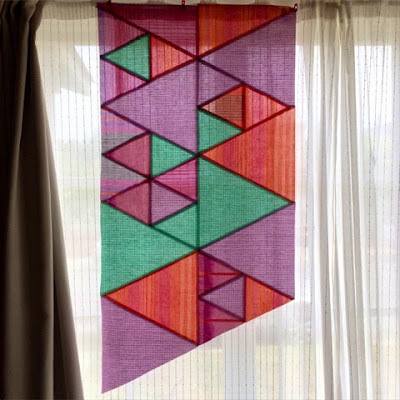 I was curious about how the difference in weave would be and I'm happy to say they didn't present anymore than the FMQ challenges I usually face. 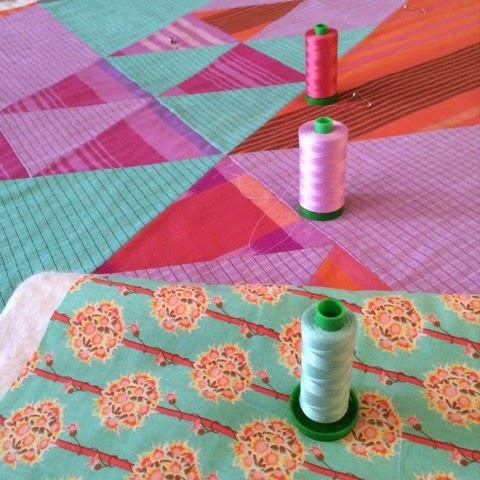 Well that's "the Finish" now for "the Feature"
Head on over to The Plaid Portico to read the loveliest feature about me written by Andover's fabric designer Carol Van Zandt . She also has some better pictures of my quilts Dig Deep and Ripple Studel on her blog than mine. Her art and designs reach beyond quilt cotton and include Greeting Cards, Gift Wrap, Cases & Skins, Kitchen Textiles and more - be sure to check it out. 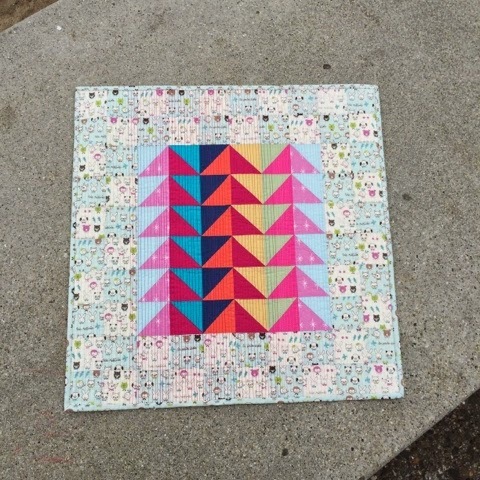 On my way home from work today I took a pitstop to Depot Hill again because I realized I never got a decent picture of this quilt of mine and I want to live up to my into! If you look really closely on the horizon you can see Moss Landing across the Monterey Bay. 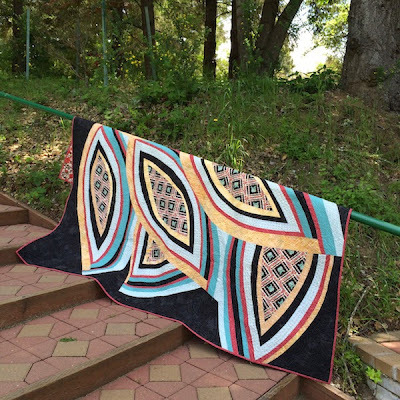 The walking path seemed an appropriate location given the quilt's name. 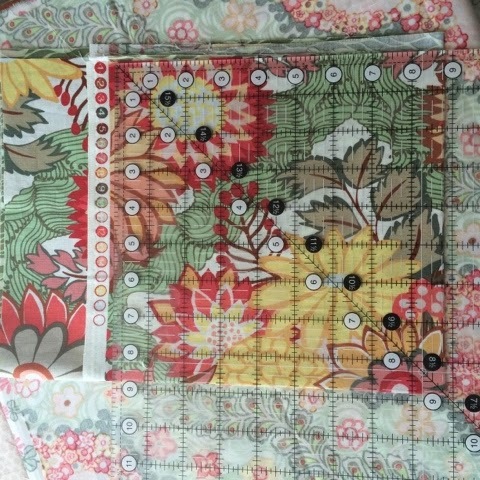 I thought I would keep the FMQ simple and let the design and fabric speak more than the quilting and then I sat down at the machine and this happened, ha ha. In over my head - loving and hating this particular stage. It's certainly not the first time I've been here or likely the last and yes I will survive. Freshly basted tops are so rewarding and calming - before the shoving and crumpling begins. The selection of Anna Maria Horner's yarn dyed woven fabric line Loominous at my LQS Harts Fabric is vast- I struggled with which to choose and came home with these six although I ended up pulling out the triangles cut out of Traffic (next to last in the stack) because the cream stripe was too dominant and distracting. There's 27 in the collection and their weave and hand are varied not mention the scrappiness of the palette. Traffic and Big Love being the super softest of the bunch and Illuminated Graph the sparkliest. Mixing metallic with yarn dye wouldn't have occurred to me. Leave it to AMH to blend old and new, traditional and modern so beautifully. Stripes and plaids presented design challenges that I expected and I has happiest including some fussy cuts. 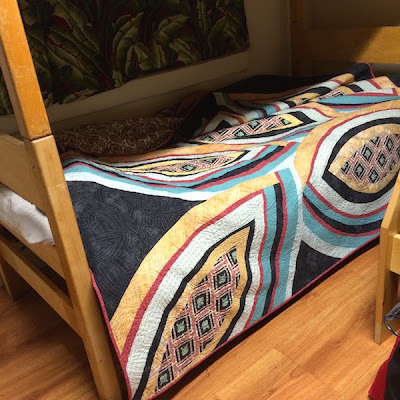 Laying out rows on my bed was an eye full with the X-Plus underneath don't you think? I also love this backlit shot with a hint of my neighbor's cars and houses shining through. 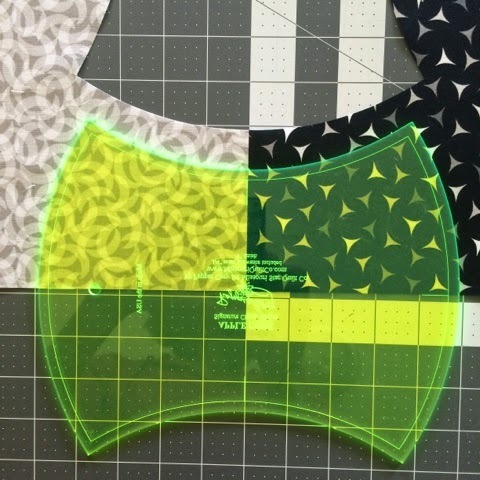 As I mentioned in this WIP post, the pattern was generated by me and the computer using Play-Crafts tool "Equal". I had to deviate from the original color placement when I axed the one fabric so it's not as true to the design as it would've been (however my head would have exploded had I not had it for reference, thank you Anne!). 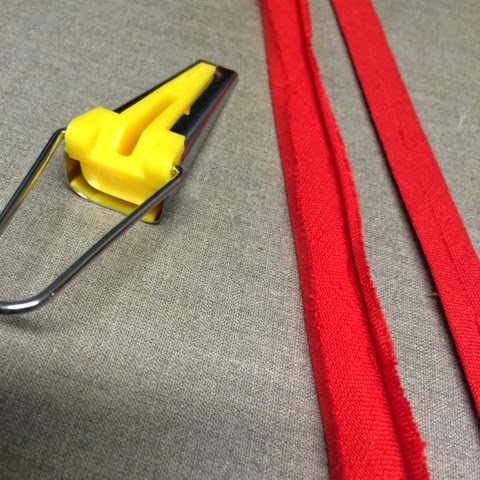 Sewing entirely on bias wasn't too unruly and I used a generous quarter seam. 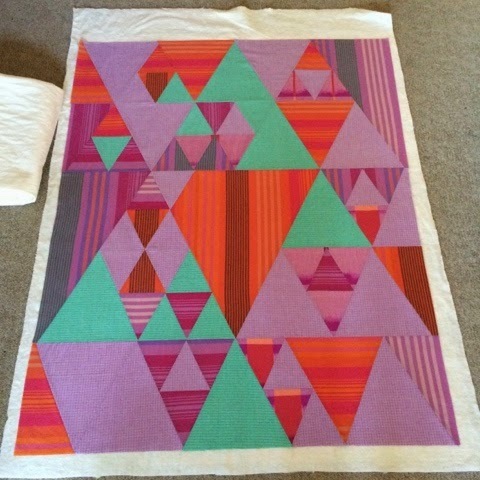 There is some fray compared to the more typical quilt cotton but nothing unmanageable. I opted to use the spool of 40wt Aurifil in middle for the entire thing with a neutral 50 wt in the bobbin but had fun auditioning thread anyway. 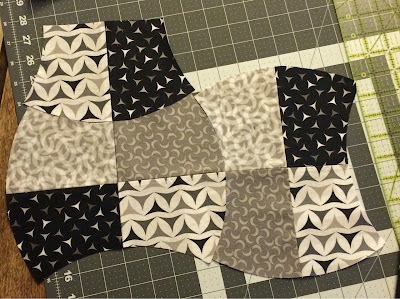 Procrastinating the actual start of FMQ could have been a factor. 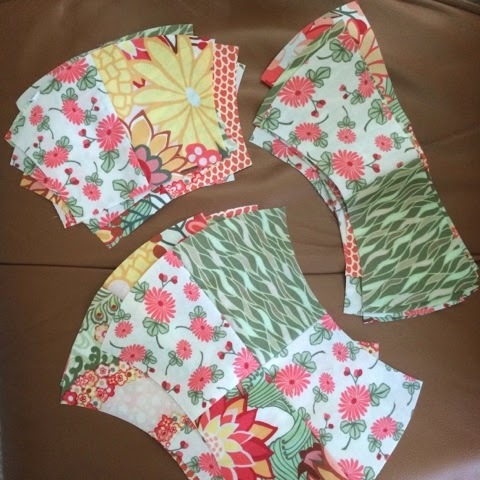 Botany from my stash won out for the backing with an added strip of Fig Tree. 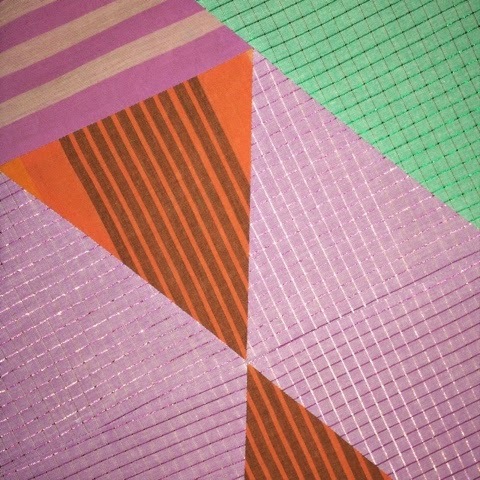 I liked the striped feel and circular shapes. The orange is a tad more peach but plays well enough. For binding I'm leaning towards a lavender solid. Now I just need to get through the rest of the quilting so that I can actually bind it and be done! 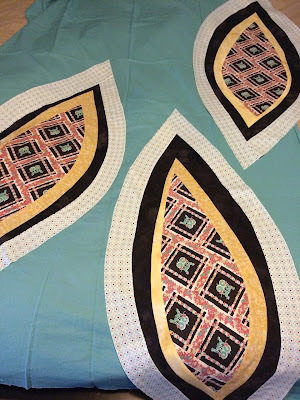 Since I didn't finish as hoped for Spring Blogger's Quilt Festival link up I'll save it for the Fall and I'm linking up to Stash #127 with Molli Sparkels and WIP Wednesday with Lee. Thanks for stopping by - I'd love for you to follow me on IG if you don't already and give a shout out if I don't follow you back. 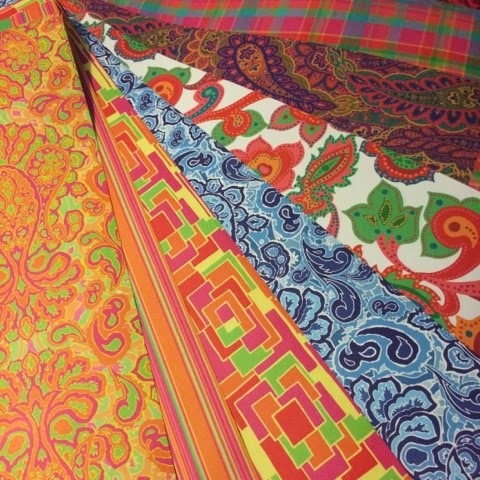 Choosing which quilts to link up for Blogger's Quilt Festival is something I take seriously. Sure it's fun to show and tell and maybe have visitors you might not otherwise have - but I like to look back and feel there was something special or pivotal about the particular project. 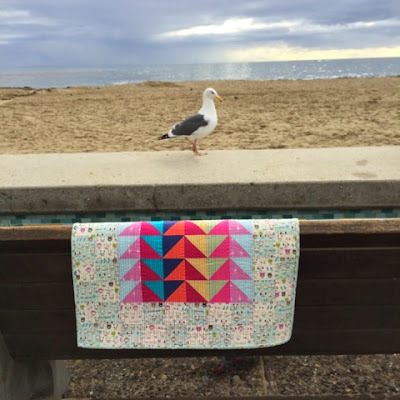 Discovering the quilting community of Instagram happened overnight because of this little mini. I had created a private account when I got my first iPhone since I could but didn't give it much thought or attention. I had burned out on Flickr swaps and bees and I had put myself on a strict no-swapping time out. Until - IGmini Swap came along. Since stalking and sneak peaks are a big part of what makes participating so much fun I changed my IG privacy to a public. Sometimes I'm guilty of overgramming and sometimes I'm clueless who's who and what's what but I'm having a great time, thanks to this little mini. 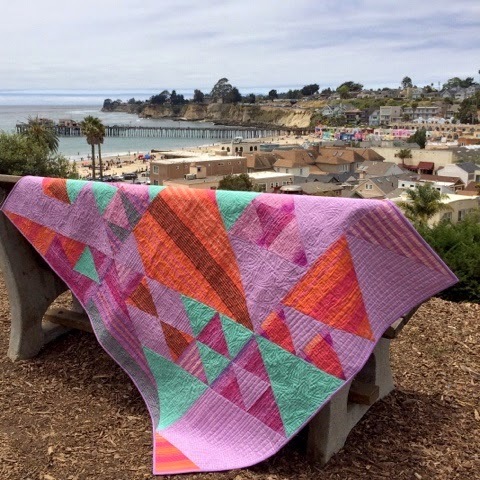 Be sure to check out all of this years Blogger's Quilt Festival categories and cast your vote with this link. You can read more about the creation of Goats Askew in this post . The recently released and very popular book (for good reason!!) 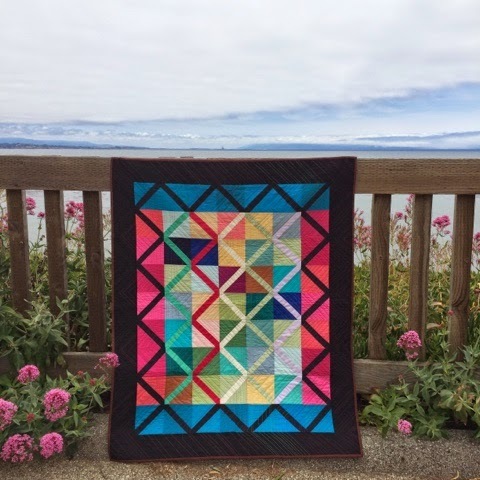 The Improv Handbook For Modern Quiters by Sherri Lynn Wood aka: Daintytime is how this quilt came about. 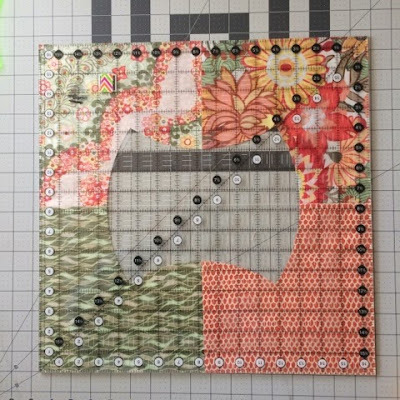 She put a call out for testers and although mine wasn't chosen for the publication, it was fun to give input and to be included in the Bias Strip Petal Gallery. My sense of time is not very good especially with the need to keep it a secret for so long. Fortunately the pictures in iPhoto are dated so I can tell you that from start to finish it took me 3 (crazy) weeks. 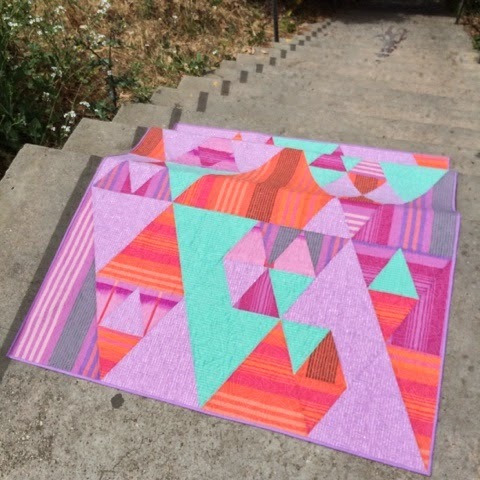 I tried to photograph steps along the way to document the journey and decisions. I considered and abandoned the idea of using this as a background. It felt too overpowering and didn't let the feature fabric shine. 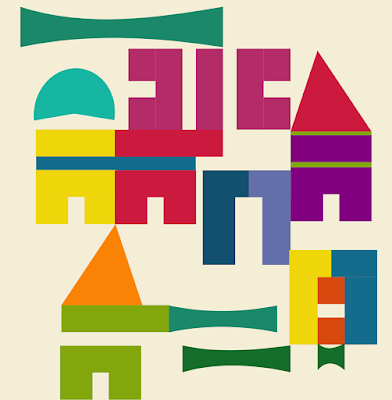 The palette is more restricted than I typically work in an effort to broaden my approach to design. There was an awkwardness to handling the large pieces and I wished for a magical "Askew" tool like in editing programs that would tip and tilt the wedges. The imbalance of strips weighing more heavily in color and width on one side than the one way I put my personal spin on it. The challenge was very rewarding especially the problem solving of inset seams and the aspect of supersized improvisational designing With endless options unexplored one day I simply must make another. 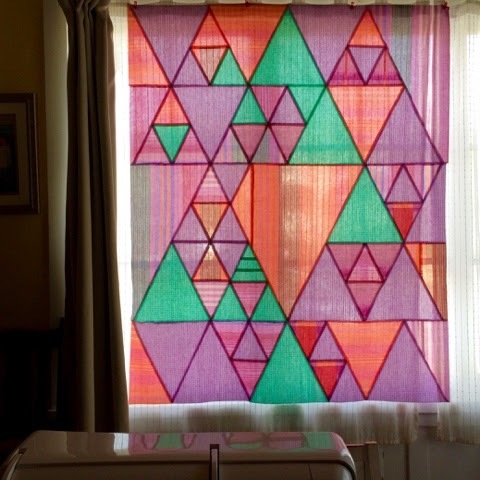 Finished size is 72"x86" Started February 23, 2014 Finished March 16, 2014. Pieced and Quilted on my Babylock Symphony with Aurifil thread. 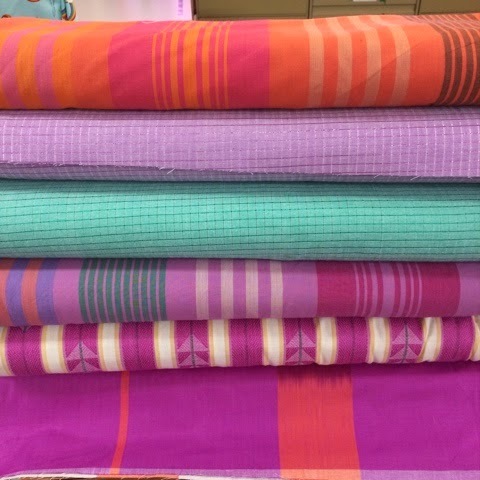 Winline Textile Bamboo batting. Fabric from stash. I've chosen to link up to the Original Design category because although the technique was from the score the final concept feels like mine - letting the fabric lead the way and the allowing the layout to find it's final destination sounds a little out there to some but not to me, especially after reading through my copy of the book and the guidance that Sherri Lynn shares. My sewing room has transformed itself into a glorified storage closet so I've migrated out to our living room. 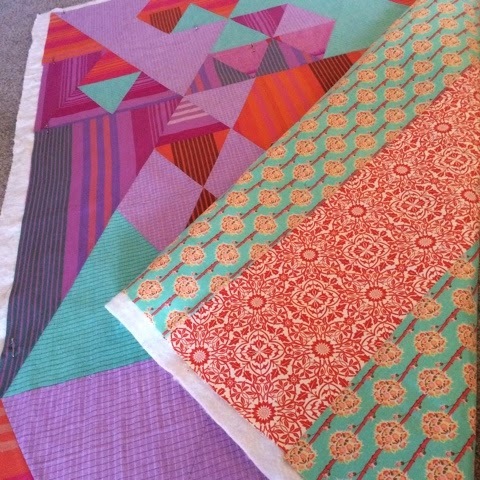 Having space came in handy for a "drop everything and quilt" party at my house with Merydith and Anne last week to sew a comfort gift for a mutual friend. 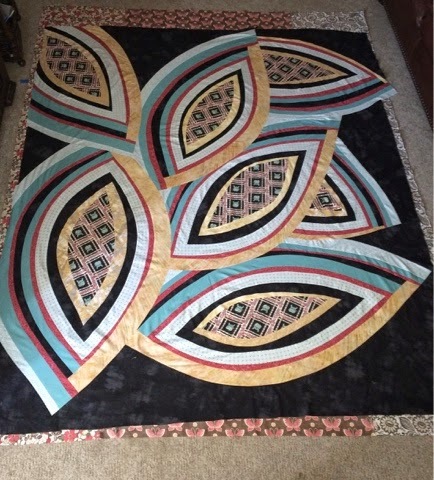 It was "temporary" so I could finish up Ripple Strudel and Dig Deep featuring Carol Van Zandt's new fabric line Luna Lounge and send them off to display in the Andover booth a Quilt Market. I have yet to move out! My SIL is coming today for a sew date, so it's a good thing. Speaking of Market - oh that IG eye candy makes me want to sneak into someone's luggage and experience the whirlwind for myself. I'm hoping that there will be schoolhouse videos and more images in the days to come. 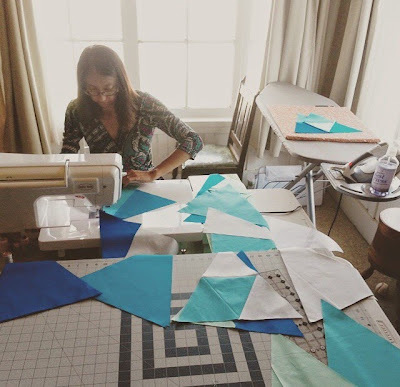 Lee had a beautiful booth and was sweet enough to take time to hostess a linky party WIP at Freshly Pieced. Not sure where time has gone but it's that time again for New Bloggers Blog Hop and this year a few of the Alumni are carrying on with sign up now open. This is a great resource for any bloggers with links to previous advice and tech help posts from a long list of talented and generous people. It's also wonderful way to discover blogs to follow. Today I thought I'd share a little bit about my Ripple Strudel quilt and add another item to the long neglected TUTORIAL TAB on the blog. 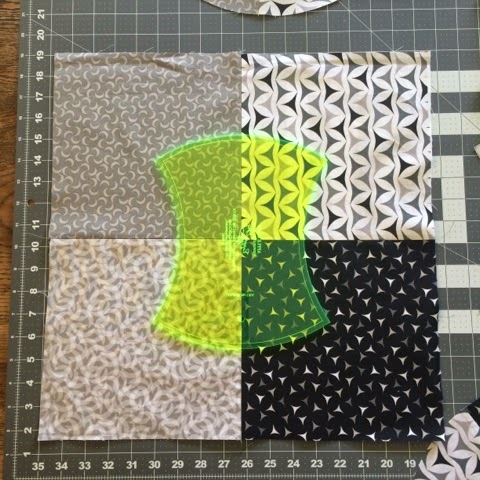 When Carol Van Zandt offered to send me some of her amazing new fabric line Luna Lounge to play with, I knew it was a great excuse to try out the large apple core template I picked up at from the Jenny Doan booth at Quilt Festival. The warm grays and black called out for a graphic design. 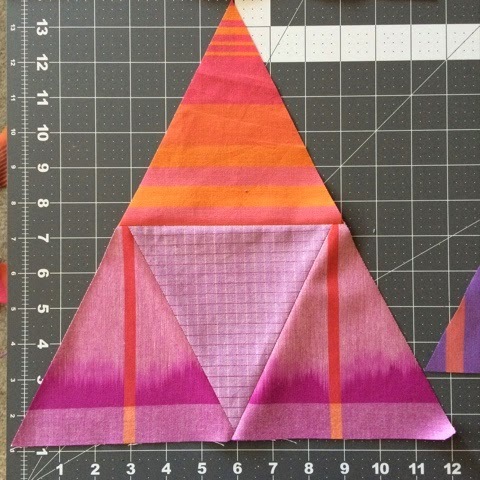 After seeing the QuiltCon bias tape challenge, I picked up the Clover tool but just like the template it has pretty much been sitting ever since. Andover's textured solid in Lacquer worked perfectly and hand-stiched like butter on the binding. 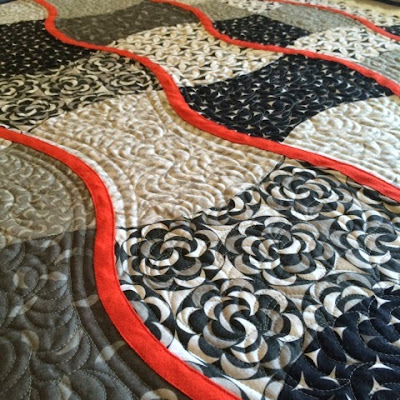 The right and wrong side of Textured Solid is pretty obvious - because, umm it's textured - so make sure to feed it through correctly to avoid the uncurling of your fold (pictured above). 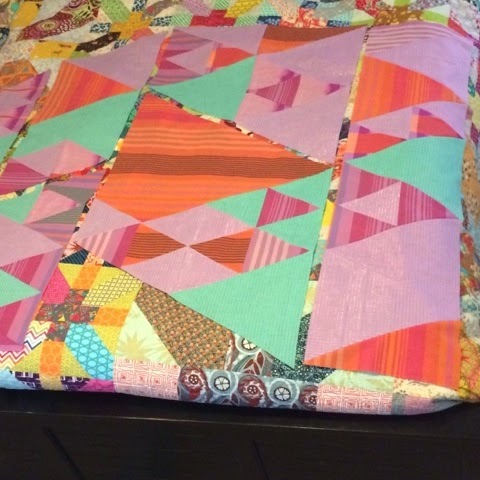 After a comment from Linda Flourishing Palms on IG about attaching the binding before trimming the excess batting/backing I remembered that I had been taught that originally and used that technique on my earliest quilts. 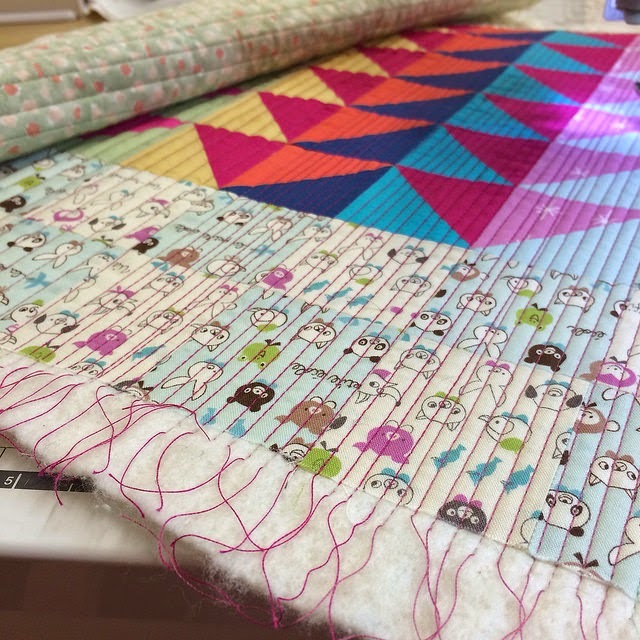 Verdict is split - there is more stability and a cleaner trim from your stitch line but I haven't converted back. There's something gratifying about the "haircut" and fresh edge that I find too appealing to wait until after. I've used FQs but yardage and a Layer cake would work as well. Also, if you don't own a template you could print one for free from sources like QuiltersCache and modify the scale. The arc is different but the concept is the same. 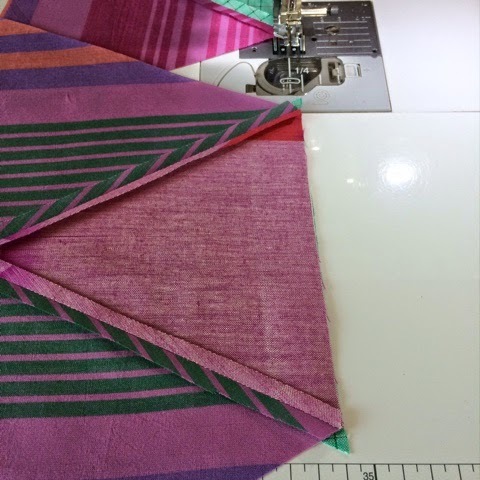 To avoid fabric waste and save time, I folded the FQ first lengthwise and then again to cut four layers at once. 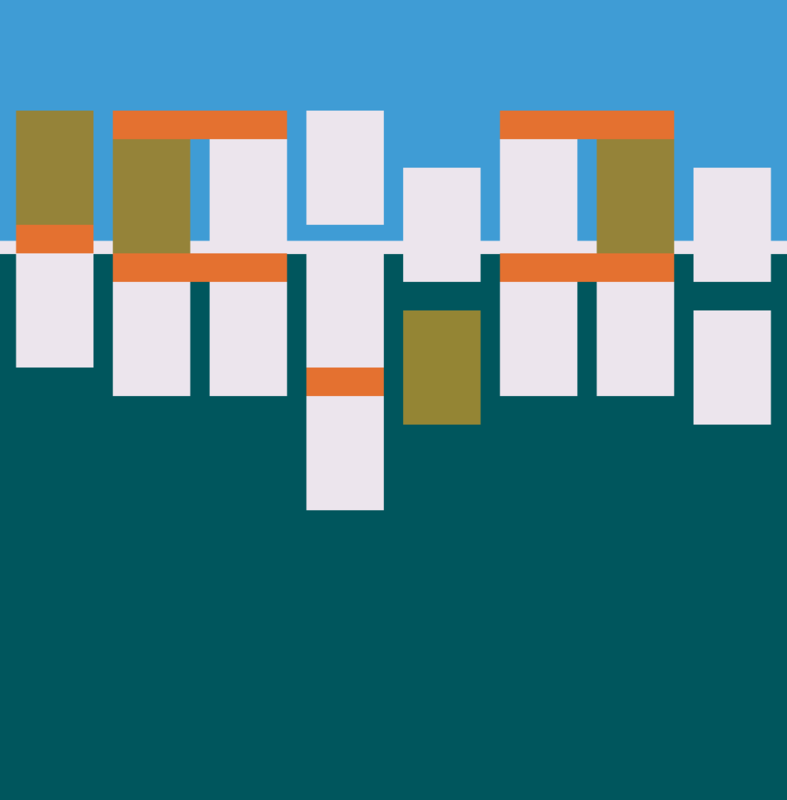 You could even use 2 FQs and get away with 8 layers because they will be trimmed later and the slight distortion from stacking that high doesn't really matter. 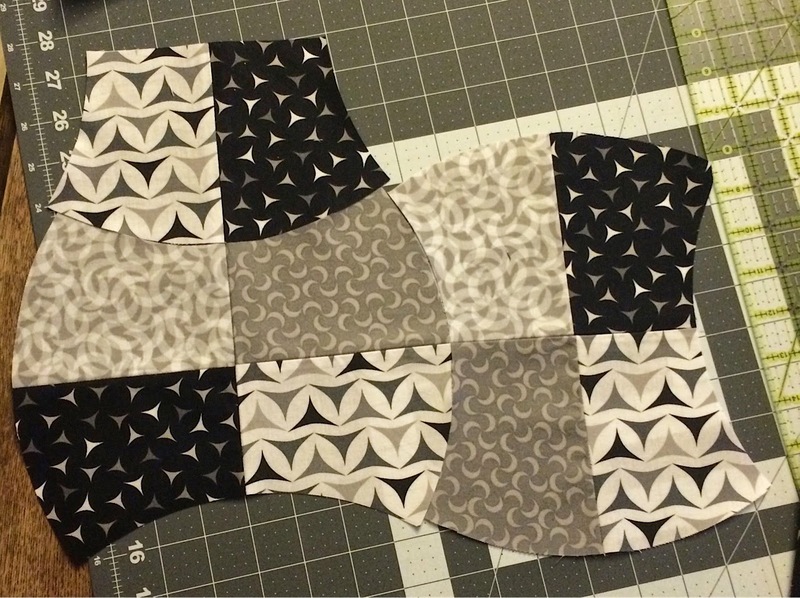 The squares just need to be at least 8 3/4". Sew together four-patch blocks and center the template. Rotary cut around with a slight over cut at each tip, just enough to free to core but not too much - you'll see why in a minute. Now it's time to clean up those mis-matched outer edges. If you have a big 16.5" ruler it's awesome - but if not, just trim with any ruler. 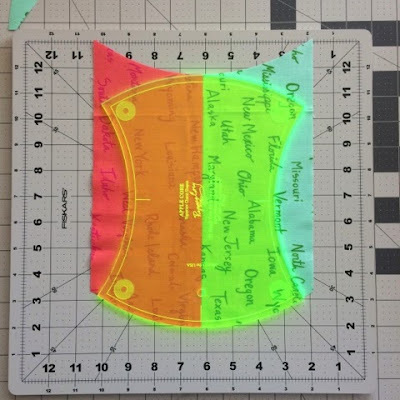 Next, line up the center marks on the template and cut as shown below. Work your way around reorienting the template, "landscape or portrait" as you go. 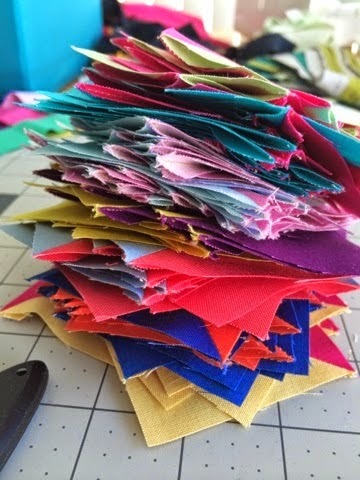 These become the parts for the quilt edge. Other than the "floppy ears" that are left behind, there's not too much waste! For a half slice, sew together 4.5" strips and cut as shown below. A rotating board is also helpful but not necessary. I like the variety half slice cores give and they can make layout more interesting. You can also add in full template cores of course. 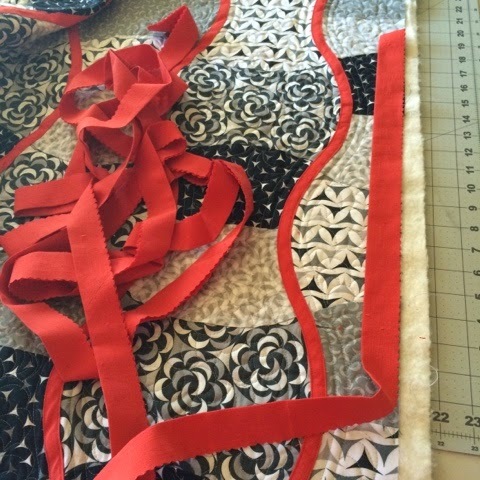 The curve is gentle enough to not require pins and the center seam of a quarter chunk actually makes it easier to line up. I'd recommend finger pressing the center for reference on the half slice or full cores to keep on target. Secondary designs appear depending upon placement, so play around with your layout before deciding. 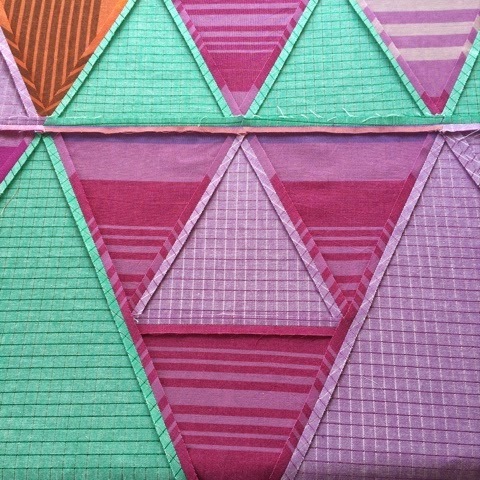 Seams can be pressed open or to the side. 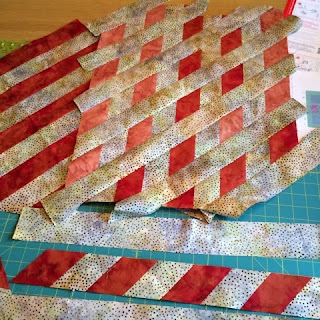 I tried it both ways and prefer open for the piecing and to the side for the rows. Sorry for the poor lighting on this one. 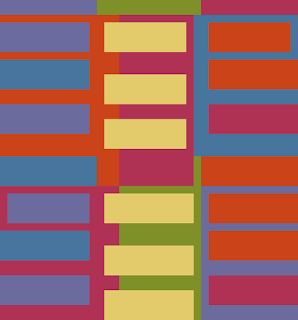 I wanted to show how I used wonder clips facing alternating directions (red or clear) to mark the bottom of each column (1-2-3). What's your trick for keeping track? 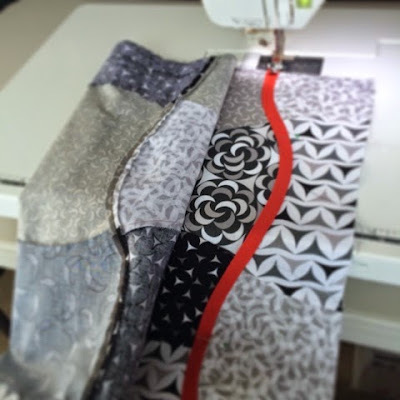 Play around with your feet to find one that you like for the topstitching of the bias. Before adding the bias down I dabbed a bit of glue here and there to secure it in place. It's not necessary but I found it helpful. 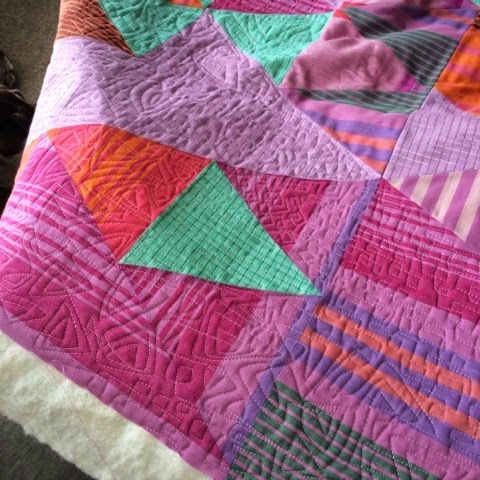 For the second quilt I decided not to add the bias because I was going for a softer appearance more inline with the palette. Full reveal of "Chunky Apples Sauce" coming soon. 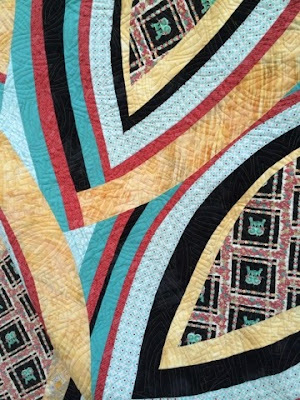 If you happen to be at Quilt Market this week or see a photo of Ripple Strudel or Dig Deep in the Andover Fabrics booth #1601- I'd love to see it. I'm home with the rest of the #notgoingtoquiltmarket folks drooling over the IG feed. 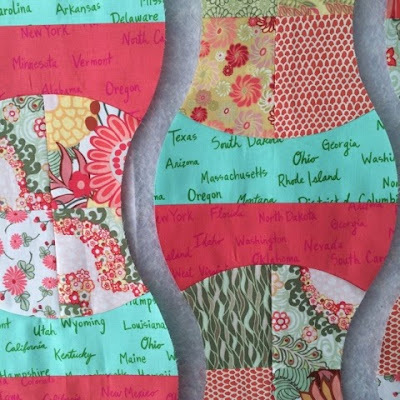 Remember all those after-the-fact QuiltCon pins exchanged that made so many people happy? Marci was the generous organizer of that swap and May is her month to be queen of Bee Social. Now I get to make something special for her. 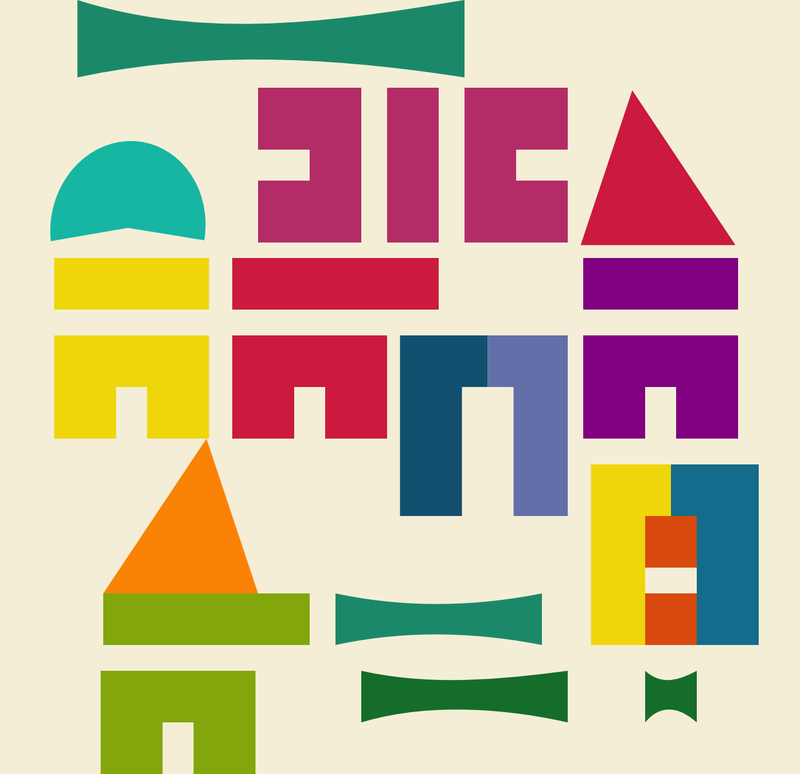 She has set out to build a bright and happy abstract village with structured improv blocks. Part of the challenge is to propose a plan with the expectation that we are free to deviate from it. My first thought when I read the charge was to use one of my QDAD designs since travel photos are a fairly common member spark. 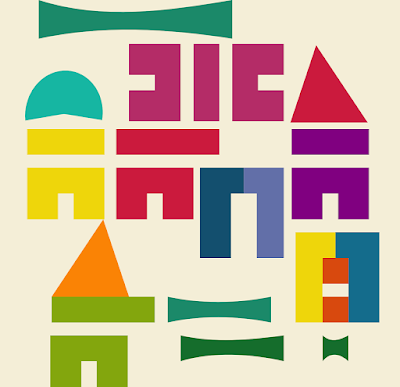 Here's one from a few days ago inspired by a photo from Michelle Wilke taken of a coastal town in Lisbon, Portugal. My QDAD design from 2/4/2015 has the palette and feel of a town to me even though it was actually a photo of Julliette's folded fabric stash stacked on a shelf. I may use one or both for my other block(s). You might recall that I've got my first "QDAD to life" in the works as one of four Q2 FAL items. 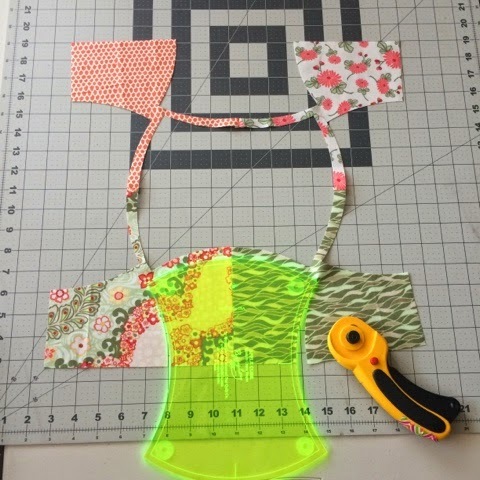 It's the WIP I'm choosing for the ALYoF May goal setting party. Slow (and I mean slow) progress was made this last weekend during a fun (and funny) sew day with my friend who is collaborating with me on the secret gift. We're basically constructing it in the most confusing and difficult manner possible and enjoying our detoured journey by laughing at ourselves about that very fact.